4th of July means food, fun, and fireworks! 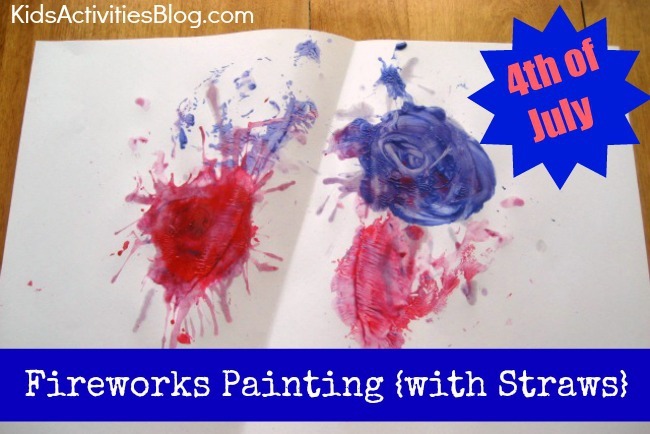 Here is a cute activity for painting fireworks that actually includes sound effects! 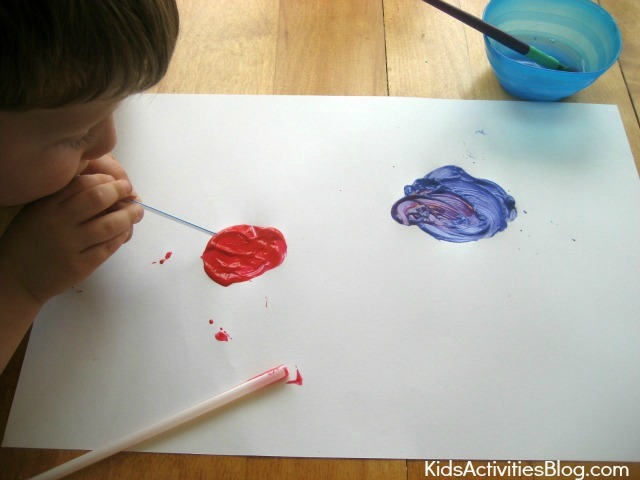 Kids Activities Blog hopes you and your child can have fun with straw painting. When you think of fireworks, I bet you think of the sounds they make as well as the colors you see. My son and I worked on a 4th of July craft that includes some of the sounds that you hear when you go to see fireworks. There was the whooshing sound of the fireworks rising upwards toward the clouds and the bang of the fireworks exploding in the sky. Let me walk you through how we created our fireworks painting. 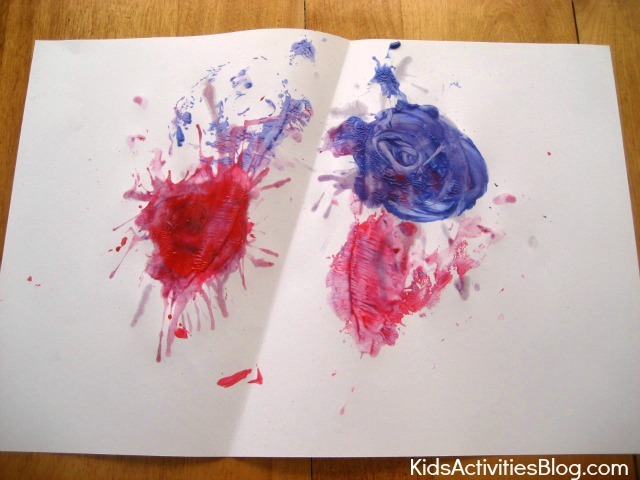 First we spread red and blue blobs of paint onto a piece of white construction paper. The blobs of paint were really thick. We watered them down a little by dipping a paintbrush in to a cup of water and then mixing the paintbrush into the blobs. Ready for the whooshing sound! Then my son blew the paint around with a large drinking straw. The paint was still a little thick so we watered it down some more. After using the large straw we tried a coffee stirrer. The coffee stirrer helped us focus the air coming out of the straw. Blowing through both straws produced a whooshing sound similar to the sounds a firework makes on its way up on the 4th of July. Both the red and the blue blobs ended up with paint exploding from them. They looked a little like the burst effect created by some fireworks. Ready for the bang sound! When fireworks exploded on the 4th of July, they make a banging sound. To create our own banging sound we folded up part of the paper so they red and blue paint blobs sort of overlapped. 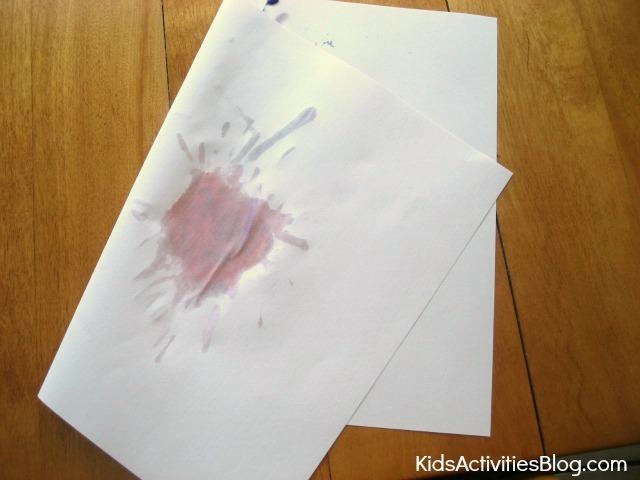 Then my son banged his hand down on the paper causing the blobs to explode onto both sides of the paper. Banging a flattened hand down on paper is sort of fun. My son did it quite a few times. When we opened the paper, we had a wonderful layered colored effect. Fireworks layer their colors on the 4th of July just like we did in our fireworks painting.